If the inlet pressure is higher than 1.4 bar (14 m) 20 PSI (46') You must install a pressure reducer to protect the drip system. Drip line to be placed along the crop rows, 1.0 m to 4.0 m apart. In order to protect the drippers from clogging due to dirt in the water. To connect 8mm driplines to the manifold 20 mm pipe by using the 3.7 mm puncher. Also to connect or repair 8 mm dripline. Another option To connect 8mm driplines to the manifold 20 mm pipe for 2 side driplines. Another option To connect 8mm driplines to the manifold 20 mm pipe. Optional for connection of independent driplines to a ½” tap. Connection between pump or water tank to the control head. Closing the 20 8 mm manifold pipe in its end by folding it into those “eye glasses”. To seal all kind of fittings threads. To punch holes in the manifold 20 mm pipes to allow the connection of any 8 mm barbed fitting. An add that stabilize and fix 8mm driplines by inserting the BloomPeg to the soil while gripping the 8 mm dripline. Use where is a must. 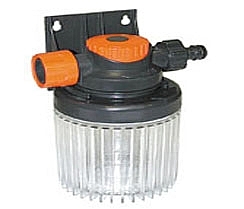 ¾” special connector for water tank bottom, not needed for a pump connection. Use in the bottom of a water tank, if you use one and need this fitting. All parts and fittings of this DIY DripKit are of high quality! This Optional fertilizer mini injector can be used mainly if you use a pressure system, when using an elevated water tank the usage is very limited to very small doses or none. This Optional Pressure Regulator* is a must should be applied only if you use a pressure system. Do not install it if you use a low pressure low elevated water tank. Probably the world smallest integral drip-line, with a very competitive pricing and very small volume/weight for air shipping.